Home / Blog / Here we go – welcome to the hectic world of an NGO! Here we go – welcome to the hectic world of an NGO! “Hi, Janika, nice to meet you – as this is my first day back in the office there’s a lot of work waiting for me, so I’ll shortly introduce you to everyone and give you just a quick viewing of our office,” head Forests campaigner Faith Doherty told me a few seconds after I arrived in EIA’s London office. So here I was; after this brief introduction, I immediately got stuck into my first task, feeling already a part of things. Sitting at my own desk, using the computer, trying to do my work as well as I could on my first day, I also had chance observed the new group of people around me. I saw a natural, easy-going and caring relationship between them. Highly visible as well was the busy, disciplined and focused working atmosphere; some of my new colleagues even take their lunch in front of the computer, but most obvious is that everyone here shares the same vision, which is why they’re all so motivated. I’m 18, have just finished high school in Germany and am now undertaking an internship for 10 weeks, seeking to find out if this field is one I want to look at more closely in my future university studies.. I knew of the organisation because of my father’s work as an environment consultant; he sometimes collaborates with EIA in its work against illegal logging and the illegal timber trade in Asia. He told me “I am thrilled by EIA because in their work they can follow a plainspoken approach which often helps advancing critical issues” and warmly advised me to apply for an internship. So here I am. I arrived in London in early October, yet every time I enter the office I’m still surprised by how small and familiar the organisation is. I remember researching EIA online and anticipated a huge crowd of people; getting to know them, I realised there are only around 25 people working from the UK office. My work is focuses on desk-based research at present, although my daily routine includes attending to the post and answering the phone; this latter is definitely not always that easy, as I am new and sometimes have no idea how I should answer questions. And as I’m German, English is not my mother tongue, which is why there sometimes some funny misunderstandings – on one occasion, a caller told me she had changed her dress and it took me a while to grasp that she’d changed her address! 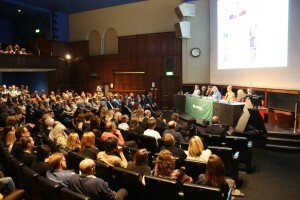 On Thursday of my first week, I went with others from the office to The Big Earthwatch Debate 2013 at the Royal Geographical Society, London, where we heard EIA Executive Director Mary Rice dispute with other experts over the question “Is it time to reconsider a legal global trade in tiger, elephants and rhino products?”. I expected, perhaps naively, to meet just a few listeners but found a large audience in the venue plus many more watching via a live broadcast on the internet. I realised many people do actually care about this issue and, following the discussion, I also realised the dimensions of the problem and that a change of the present situation is much-needed, because there are so many endangered animals being poached for illegal markets. The final audience vote indicated that a clear majority of them were against the adoption of a legal trade in the products of endangered animals. If you want to get in touch with these lovely people, if you want to help EIA achieve its goals or if you have the same vision they have, then please support them by volunteering, making a donation or fundraising for them.